This site is intended as a forum for sharing materials and resources for teaching Emotional Literacy in prisons. 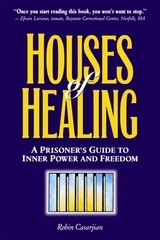 This program is based on the work of Robin Casarjian and the book Houses of Healing: a Prisoners Guide to Inner Power and Freedom. The book is available from The Lionheart Foundation. There are seven sections below: Class dynamics for ideas on how to create the safety and encourage participation in classes; Exercises for ideas on ways to present class material; Handouts for resources to supplement the class content; Agendas for lesson plans; Certificates and Evaluations; Book recommendations to share suggestions on books related to the teaching materials; and a section on caring for ourselves. There is also a forum for discussions on teaching materials and this website. Use the forum links on the sidebar to access these features. This section describes techniques for creating safety in the group and encouraging participation. This section contains ways to present material and encourage discussions of class topics. You talkin to me? - a poem that illustrates sub-personalities and "seeing the light"
Watch Your Language - a reading on why judgment is a narrow and limiting way to view the world. the Snake and the Monk - a parable to address "being a doormat"
Self talk - what do we tell ourselves when we are angry? Anger Response Styles - an exercise for understanding aggressive, passive, passive/aggressive and assertive styles. the Guest House - a poem by Rumi for discussions on how we think about and react to our emotions. These are handouts that can be used to enhance the learning process. Certificates and evaluation forms, etc. Please share certificates, evaluation forms and other supporting materials here. Please share agendas, or other planning materials here. Please list books that you find informative for your teaching. Ideas for work to be done outside of classtime.